The Musée d’art contemporain de Montréal had the great pleasure of unveiling on April 9, 2018, the winning project of the architectural competition launched in June 2017 and presenting the design and preliminary drawings of the new Museum. 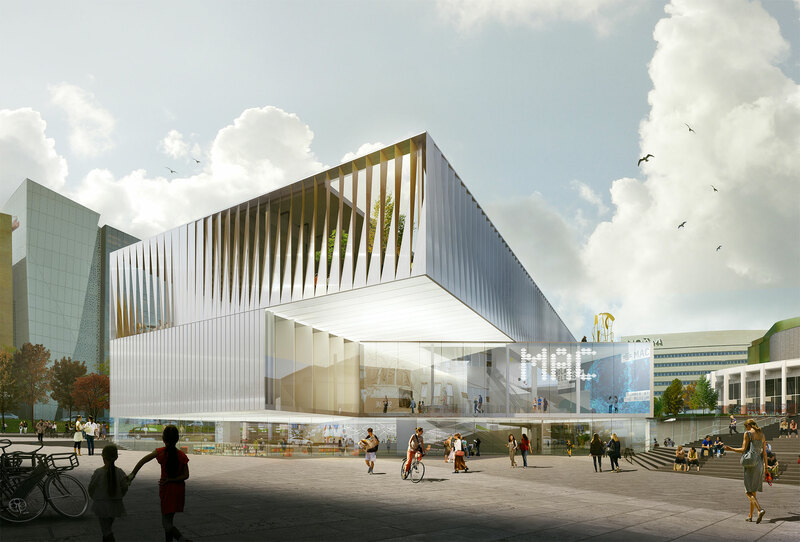 It was the proposal of Saucier+Perrotte Architectes / GLCRM & Associés Architectes, a consortium of Quebec architects, that captured the top honours. Inspiring, luminous and relevant, this proposal, selected unanimously by the jury, will result in a resolutely contemporary construction that is fully coherent with the Museum’s raison d’être. With this transformation, the MAC embarks, visionary and alive, on a new chapter in its history and continues its momentum to embrace its full potential. From an urban planning perspective, several features will link the new MAC to its context. 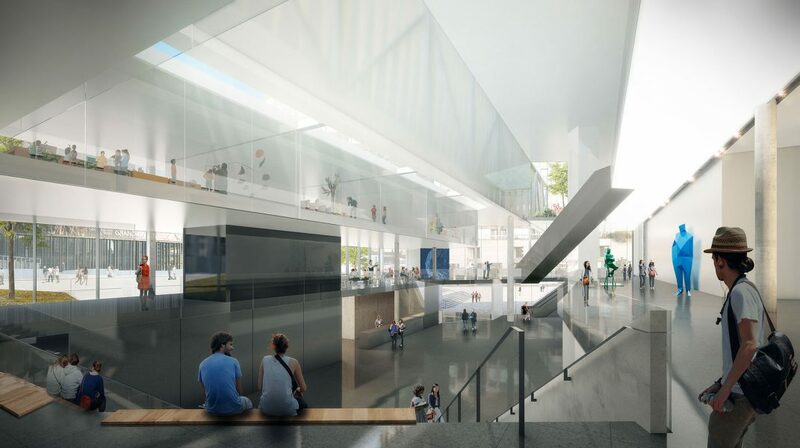 On the ground floor, the museum will shine through its transparency and the activities in its public spaces, namely the lobby, reception and boutique. At the Esplanade level, the project features a complex whose proportions and architectural expression will fit in seamlessly with neighbouring buildings. Indeed, the upper section will be composed of an envelope of folded metal blades revealing the interior spaces at times, and filtering natural light. 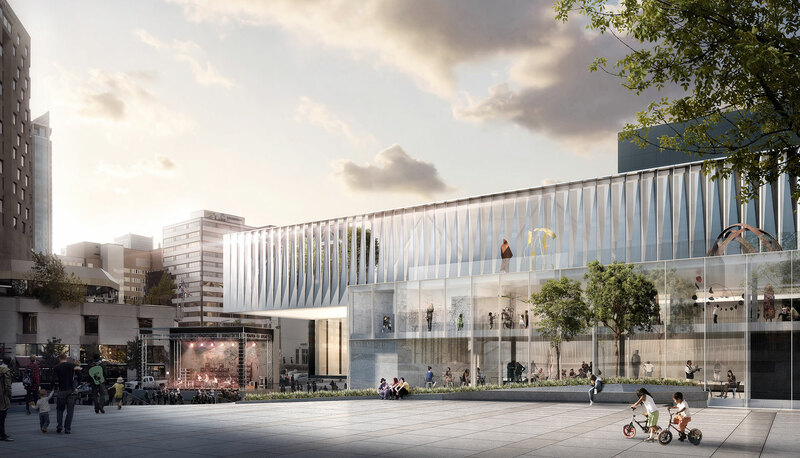 The verticality thus expressed will underline the public character of the museum and, in a much more contemporary way, will harmonize with Salle Wilfrid-Pelletier and Théâtre Maisonneuve. 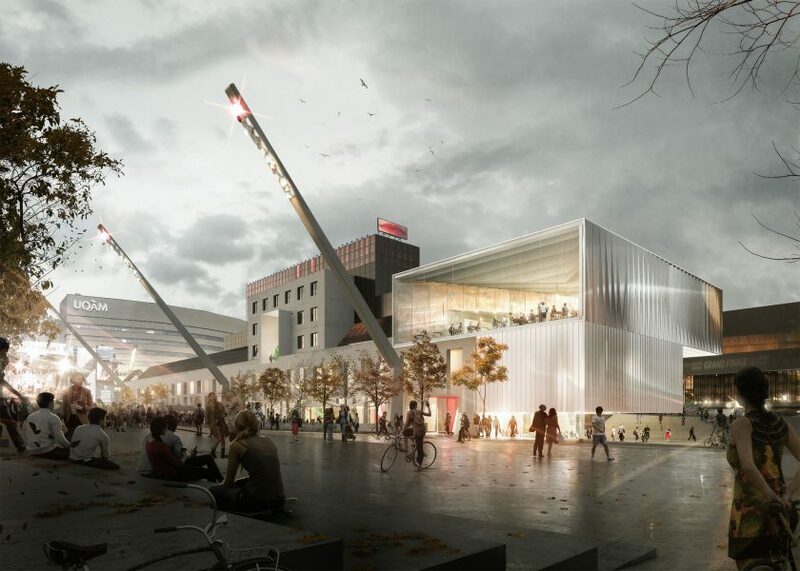 On Jeanne-Mance Street, given the transparent and luminous volume of the expansion, the project will create new essential links with the Place des Festivals. The museum boutique, astutely placed at the intersection of Jeanne- Mance and Sainte-Catherine, will be in a choice location. On level 2, a large window will showcase the museum restaurant, a doubleheight space that will open onto an outdoor terrace. 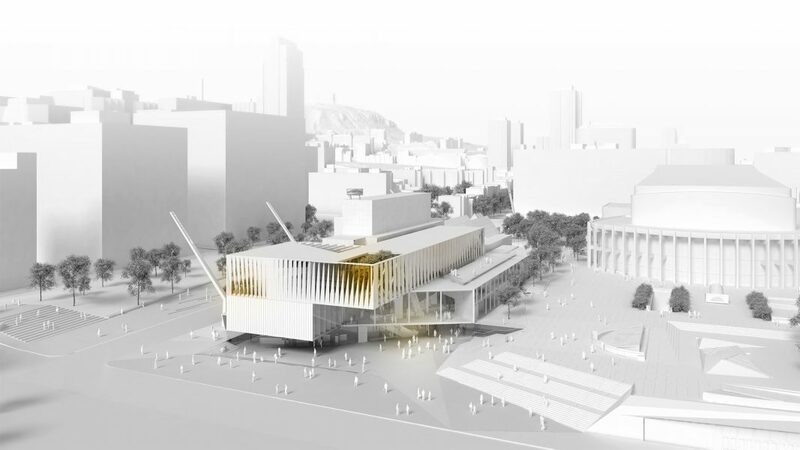 These public spaces will benefit from the bustle of the Quartier des spectacles and announce museum activities day and night. 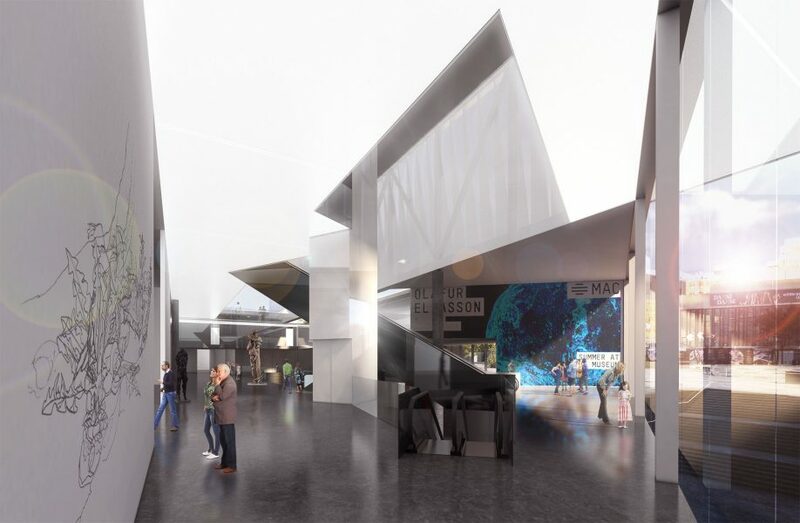 The museum will enjoy far greater visibility on Sainte-Catherine Street, with the angular overhang of the expansion. Under this cantilevered structure, the generous square of the museum will naturally guide the visitors to the main entrance, while freeing up the space necessary for holding the festivals. The proposed space also preserves the view of the stage from the Esplanade during concerts. When visitors enter the museum, they will be plunged into the vast space of the main hall, where they will come into direct contact with contemporary art. Bathed in abundant eastern light, this three-storey, gallery-lined atrium can be used as an additional exhibition area as well as a multi-functional space for special events. From floor to floor, the linear galleries with access to the exhibition spaces will create a new art showcase in addition to increasing the visibility of the various exhibitions. With its series of seating tiers, the hall of the new MAC will take on an undeniably public character, much like the expanse of the neighbouring Esplanade. Taking shape as objects in space, the traffic elements (stairs, elevator, seats) will be part of the interior directionality. At the Esplanade level, visitors will access the main exhibition areas opening onto the Esplanade. It is also at this level that the reception of the educational zone is located, with its independent entrance. At the middle level, workshops will provide an atmosphere conducive to focus and creation. 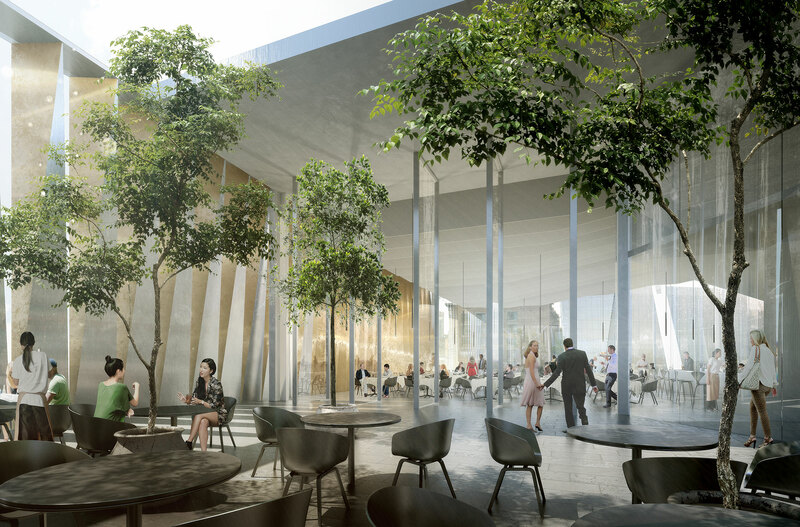 At level 2, the museum’s restaurant will offer a unique view of the Place des Festivals and will open onto a large sheltered terrace. This level will also provide access to the terrace on the roof of the workshops. Facing the Esplanade and the Place des Arts, this terrace will be a considerable asset for the museum, which will be able to plan various public and private events there. Lastly, the administrative spaces located at levels 3 and 4 will be redesigned in a more functional way to meet the changing needs of the institution. An exterior facade that has been transformed by the expansion of the main entrance and the added area on the 2nd floor. The MAC must remain active and on hand throughout the construction period in order to maintain its relationship with the city and community presence. Between the closing and reopening, the MAC will set up headquarters in a permanent location to be announced at a later date, and all the while make its influence throughout the city with multi-site and ephemeral exhibitions. The programming, while limited, will still bear the hallmarks of excellence and rigour for which the MAC is known and demonstrate its passion to present the most relevant and current contemporary art. 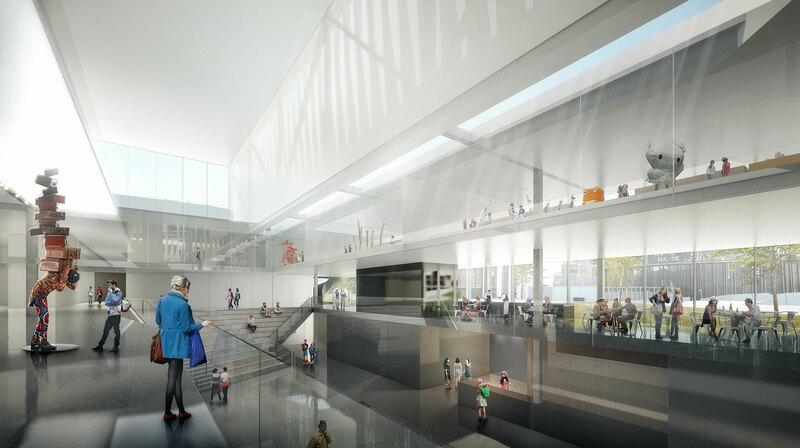 This transition period will come with its share of challenges, but it will also give the MAC an opportunity to explore both new partnerships and new exhibition spaces, and display even greater creativity. The Foundation is continuing its fundraising campaign to finance the MAC transformation project. Investing in the MAC produces significant economic, cultural and touristic results. Nowadays museums are known to be strong economic development levers that play an essential role in the growth of a city. The business sector understands the importance of supporting the future projects of institutions like the MAC. With the improvement and diversification of the MAC’s revenue sources, as well as the Foundation’s and the governments’ remarkable efforts, the major project’s success is all but certain.